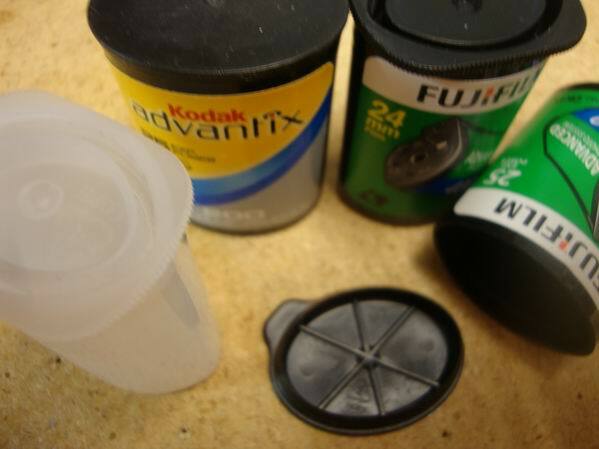 A short primer on 35mm film cans. They are not all the same, and they have proven capabilities and disadvantages depending on the situation. #1 - Your basic Black and Grey 35mm film can. We've all seen them and used them for years. They are still the standard go-to when you need a container that will be exposed to the elements. They are mostly waterPROOF, not necessarily waterTIGHT...but are the best option for outdoor use. Note the prominent lip on the container and the ringed inside-and-outside gasket on the inside of the lid. 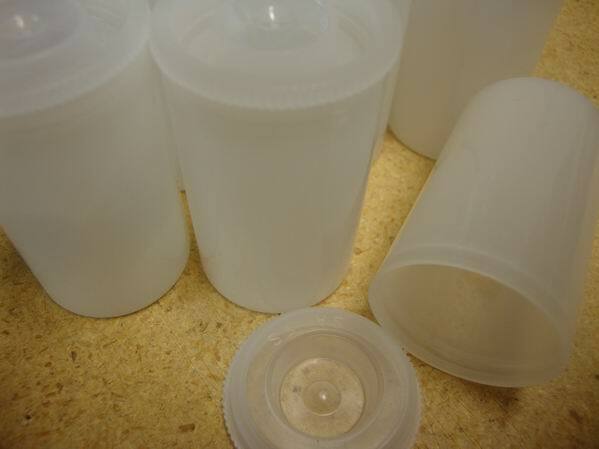 Some lids have a smooth gasket inside and out, but they don't 'snap' on and seal as tightly. 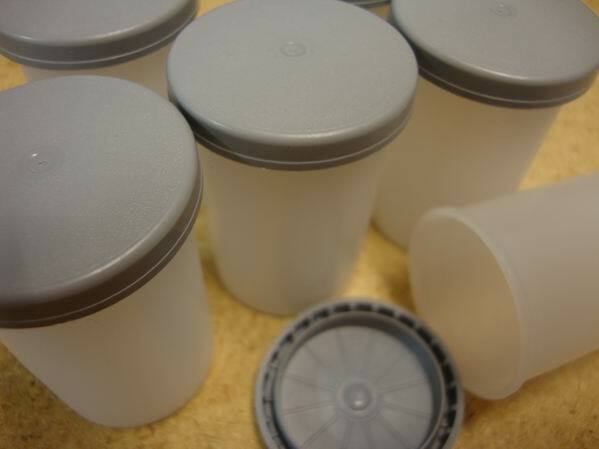 #2 - Stylish White Tubular 35mm film can. This one has a lid that snaps INSIDE the container. A poor choice for any outdoor application that is exposed to the weather, this one is much better suited to use INSIDE another container; say, to hold the logbook, cito bags, or other small items. The material also seems to be somewhat more brittle than good old #1. #3 - Odd Duck 35mm. This one is a fail at most any application. The lid snaps outside the container, but the lip is too small and the inner gasket too small to properly make a waterproof seal. They tend to pop their lids spontaneously at times. Save yourself the trouble and use these for small items in your home workshop. #4 - The FUJI 35mm. 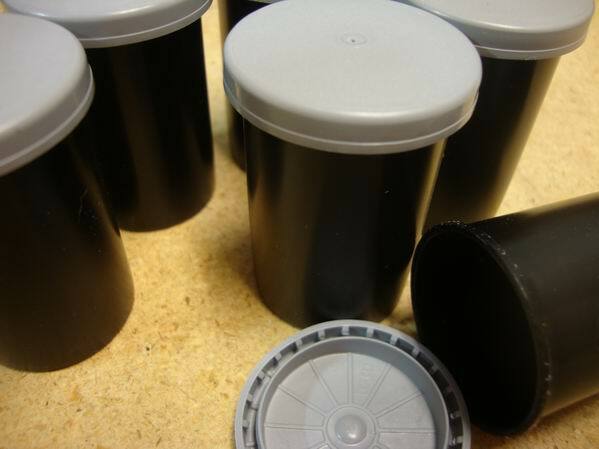 These containers, by several manufacturers, are mostly oval, black or white, with a snap lid that goes INSIDE the container. Once again, not so good for outdoor use, but handy inside other containers. As was mentioned to me in a different post on the forum, you can ask for them at any big box store photo lab. I asked for 5-10 at a Walmart and they gave about 20. I did the same once, and got 8 dozen! I stumbled upon about 50 of the #2's today. If you have a need let me know. I will bring them to the next M&E. thank you for the lesson master Yoda... good to know best, better, good, no-good for geocaching containers from those in the know. I reckon a having a container swap at this 'Meet & Eat' (or the following one) would be a good idea, especially with GAG15 coming up later in the fall. All we need now is a location that goes through ammunition as quickly... so they will be just as liberal with the ammo cans. To who ever beat me to the Kanata Walmart this morning and cleaned out all of the film containers (assuming it was even a geocacher), may there be heavy tree cover where ever you are caching next . 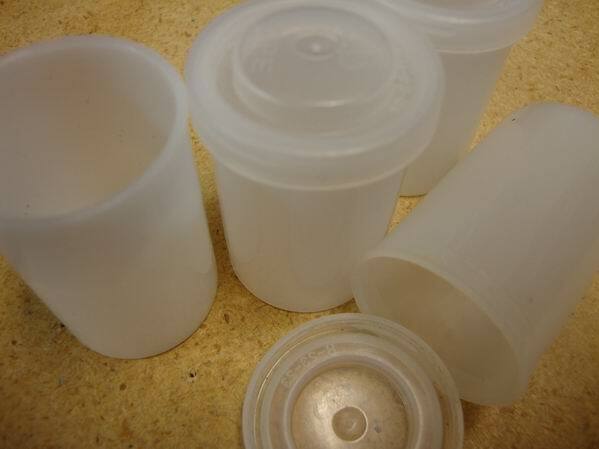 Seriously, is there any concern that the supply of these containers is drying up? I've been to a few photo places and only managed to get a few and they are usually not types #1 or 2. Need a few for a project I'm working on, (was hoping for type #1's but will make due with #2's) but I've had to hunt a little more that I thought I'd have to. I tried to give away a ton of #2's with a few of the less desirable containers away earlier this year, and eventually (this past week) threw them in the garbage. They might still be in my garage. I also have a bag of #1's (At least 30 containers) at home that are available if you are ever in Orleans. Drop me a PM if you want them. THX for the offer but I'm in the West end and need them in the next couple of days as I promised have the cache out shortly. If you are at any of the workshops maybe I could get a few #1's for the future. Next couple of cache ideas don't require them. i have a bag of #1s. how many do you need?